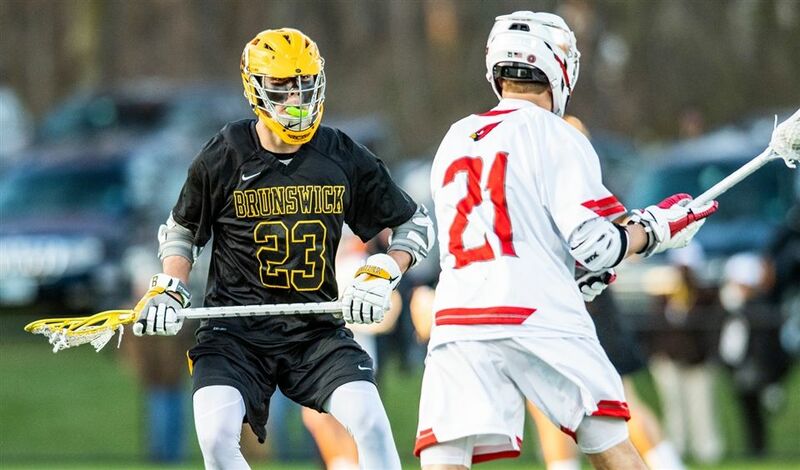 Brunswick, ranked 11th nationally, built a 6-0 halftime lead over 13th-ranked Boys’ Latin and rolled to a decisive 10-2 win over the Lakers on Franklin Field on the University of Pennsylvania campus on Tuesday night. The non-league win boosts the Bruins to 2-0, while Boys’ Latin falls to 4-3 overall. Brunswick opened the game with a first-quarter goal by Brody Firestein at 11:37. Leading 1-0, Brunswick goalie Christian Barnard (career-high 17 saves) turned away a pair of open shots by the Lakers to preserve the one-goal advantage. Following the stops, the Bruins tacked on a pair of goals and Barnard made another key save, as Brunswick built a 3-0 lead by the 5:02 mark of the first frame. After the Brunswick man-down defense denied the Boys’ Latin offense a shot during a one-minute penalty, Christian Ronda made it a 4-0 game with a crisp, low shot at 3:48. Ronda set-up the final goal of the quarter, feeding Michael Gottlieb with 24 seconds left. In the second quarter, Brunswick elongated their possessions and shut down the Boys’ Latin attack. The Bruins scored the lone goal of the frame, as AJ Delgado made it a 6-0 contest at 9:25, finishing off an assist from Firestein. Brunswick added two more goals in the third quarter for an 8-0 lead, as the Lakers got on the board with a solo tally at the 1:26 mark. Just over a minute later, Delgado scored his second goal of the game off a feed from Liam Fairback, giving the Bruins a 9-1 lead after three quarters. The teams exchanged solo goals in the fourth quarter for the 10-2 final. Edward Glassmeyer led Brunswick with six groundballs, as Colin Mulshine, Mackesy, Ian Murray and Logan Darrin each grabbed three rollers apiece. The Bruins won 8/16 face-offs overall, as Koby Ginder went 7/10 from the X, while Blake Burchill won 1/6 match-ups. Brunswick opens New England West 1 action with a home game against 14th-ranked Deerfield on Saturday, March 30.